Get ready to take your snacking to the next level. 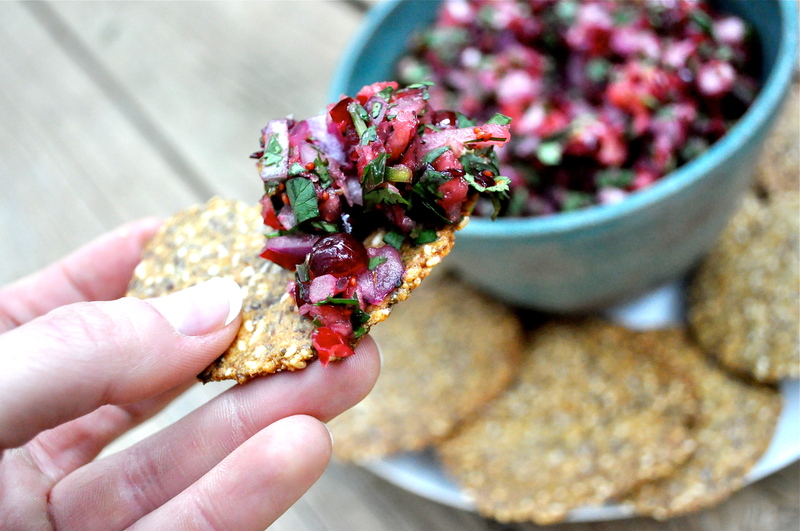 We’re going to talk paleo chips and salsa – holiday style. Chips and salsa are staples in Texas. It’s what you whip out to curb your appetite for an after school snack, Saturday football game munchie, or the ravenous pre dinner I’m-too-hungry-to-wait feigned starvation (guilty). 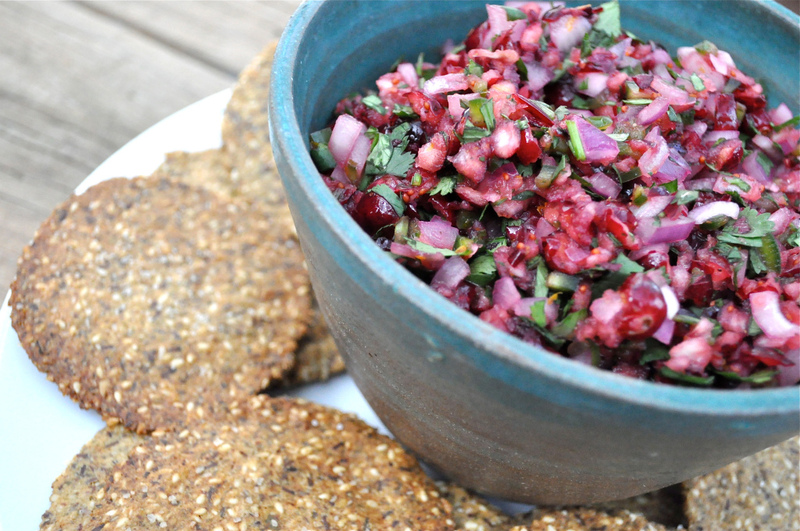 In an effort to continually diversify my pallet, I tried …and then loved… cranberries. How did I go so long without knowing how amazing cranberries are? In case you’re as confused as I was, there is not an orchard of cranberry trees that grows can-shaped maroon goo for decorating our dinner table during Thanksgiving and Christmas (usually found next to the mini sweet pickle decoration – YUCK). Cranberries are in fact these crisp tart little bites of heaven that we should all enjoy more often. 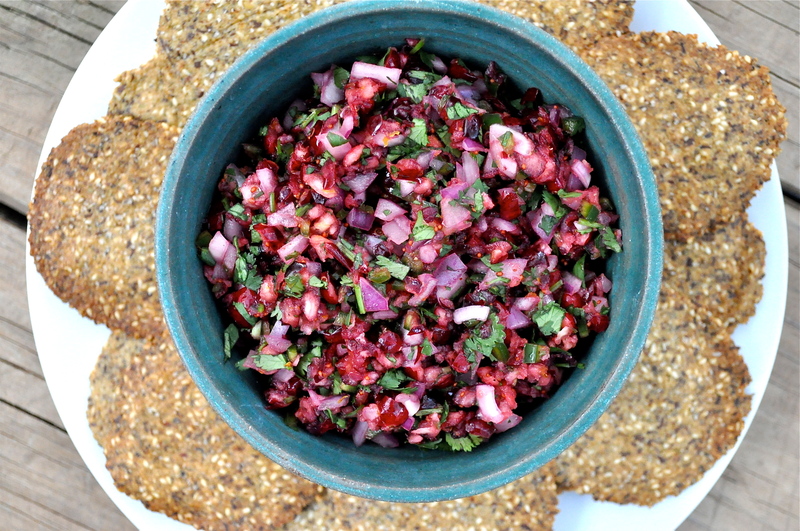 Instead, I give you … the Cranberry Salsa. 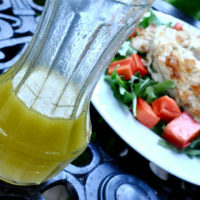 I came across the recipe below for paleo chips at Jen’s Gone Paleo. I made a couple changes to the flavors. These chips work really well with the salsa. When the chips run out, save the rest of the salsa for your next salad. 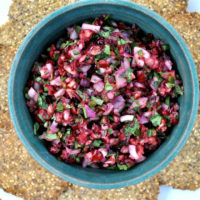 Top a bed of field greens with leftover turkey and a generous spoonful of Cranberry Salsa. Yum! Roughly chop the cranberries in a food processor. Stir in the red onions, cilantro, jalapenos, lime juice, orange zest, orange juice, salt, and pepper. Pour in a bowl and enjoy! Add the water and oil then evenly combine. The mixture will be sticky. Place about 1 tablespoon of the mixture evenly on the baking sheet and smash with another piece of parchment paper and a rolling pin. Bake for 15 minutes, or until crisp. Yum! 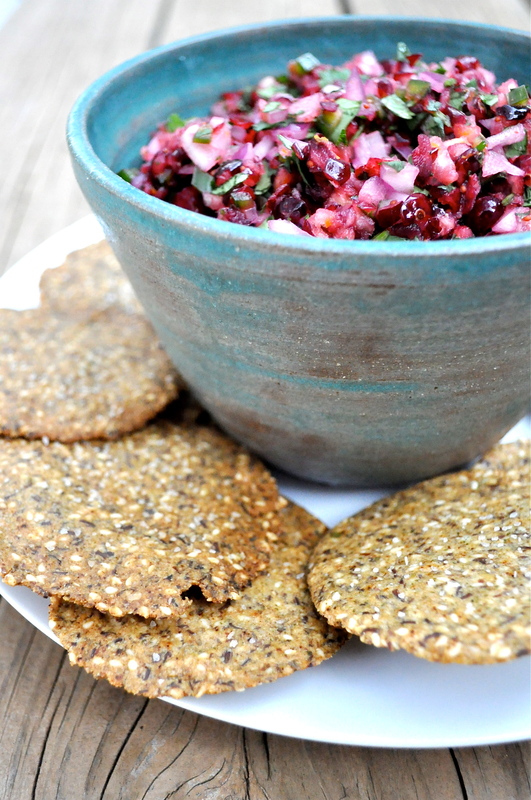 Love cranberries and these chips look and sound great. Thanks. 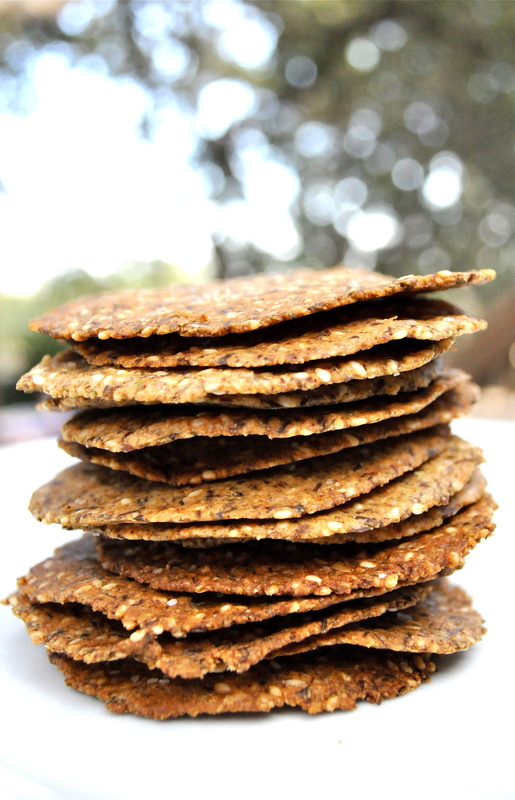 We’ve been eating grain free about 4 months and I have been seriously missing crackers. These are really good! Mine didn’t look quite as pretty though not far off. I probably could have let them cook a bit more to brown them up and I’m missing the dark bits -black sesame maybe? I will definately be making these again. Maybe with the cranberry salsa next time. Thank you for the recipe! I’m so glad you liked the chips! The black bits are from the flax seed meal, I believe. Keep up the great work! 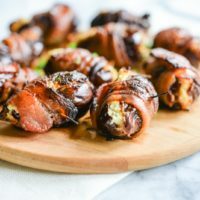 This is perfect for a Thanksgiving appetizer. Can’t wait! So salty! Is it just me or is the salsa really salty? I swear I followed the recipe- but man. So salty. I’m going to try to add the rest of my cranberries to it to desaltify. But other than that, good! The chip/crackers were tasty. I agree just a bit salty. I think I’m going to balance it out with a tsp-tbsp of stevia or agave nectar; a bit different than the salsa I’m used to. Absolutely love these chips and salsa, I found that most of the ingredients can be left out or substituted. 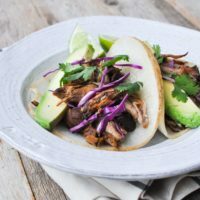 But this recipe is so gooooood. 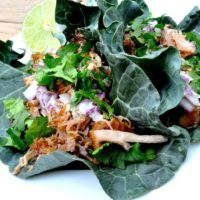 I’ve been clean eating at the start of 2017 and I love this recipe and I eat them all the time!